There are 9 different reservation statuses for the reservation process and each status lets you know what stage the reservation is on. A grey coloured status with the word “Quote”. This means that the reservation is not actually a booking and does not account for availability but rather get an indication of the prices that they can compare. An orange coloured status with the word “Open”. This means that the reservation is a confirmed booking that a customer will be picking up hence the system will update the availability. A green coloured status with the word “Rental”. This means that the vehicle assigned to the booking is currently on rent to the customer and therefore will not show as available on the system. A blue coloured status with the word “Completed”. This means that the customer has returned the vehicle and has paid in full, therefore has no outstanding balance in their rental. Do note that the customer has to pay in full then can you close the reservation for this status to appear. A red coloured status with the word “Cancelled”. This means that the customer has cancelled a confirmed booking, therefore, the system will update the availability of the vehicle. You can set the amount of the cancellation fees in the settings. A green coloured status with the words “Cancelled Paid”. This means that the customer has paid for the cancelled booking and therefore has no outstanding balance. A red coloured status with the words “No Show”. This means that the customer has confirmed a book but did not arrive to pick up the aforementioned vehicle. You can set the amount for the no show fees in the settings. A green coloured status with the words “No Show Paid”. This means that the customer has paid for the no show booking and therefore has no outstanding balance. A grey coloured status with the words “Pending”. This means that the system requires a specific action before proceeding with the reservation process. Where do I find information about the different reservation statuses? 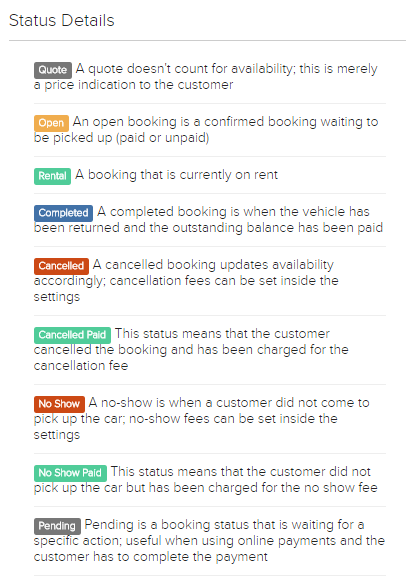 You can also refer to the different statuses by going to the Settings under the Car Rental category. You can find the statuses on the right of the page.